Source: The Guardian – At least 2,884 non-urgent operations have been cancelled, as junior doctors began their second 24-hour strike in their five month dispute with government over new contracts.The walkout follows the breakdown of last-ditch talks between the British Medical Association, NHS Employers and the Department of Health over the shape of the new contract that all juniors in England will operate under from August. Health secretary Jeremy Hunt claimed that 43% of junior doctors have showed up to work – slightly more than during the first 24 hour strike last month. NHS England later confirmed that the 43% figure included doctors who had never intended to strike, such as those working in emergency care. Shadow health secretary Heidi Alexander said the government could have avoided the strike. But Shadow Justice Secretary Lord Falconer said Labour was “neutral” on whether the strike should go ahead. Labour leader Jeremy Corbyn did not mention the strike at PMQs. Nearly 90 per cent of junior doctors would consider resigning from the NHS if the Government follows through on its threat to impose a new contract on them, according to a poll of more than 1,000 medics. As thousands of junior doctors commence their second strike on 10 February, the survey, seen exclusively by The Independent, reveals the depths of disillusionment within the profession and will increase pressure on the Health Secretary Jeremy Hunt, who indicated he was ready to impose the contract. Source – The Telegraph – Junior doctors – which refers to all doctors below consultant level – will provide emergency care only from 8am in the 24-hour walkout. Health secretary Jeremy Hunt today said that 43 per cent of junior doctors turned up to work – slightly more than during the first 24 hour strike last month. Junior Doctors and the NHS need your support! On Thursday 19th November 2015, 98% of Junior Doctors balloted voted in favour of strike action. This is an unprecedented ballot result, with Junior Doctors not having gone on strike since the 1970’s. It signifies their grave concerns related to the threat of an imposed contract that shall be both unfair on them and unsafe for their patients. Industrial action did not take place in December 2015, with the Government agreeing that they would ‘temporarily’ withdraw their threat of imposition of the new contract. The independent arbitration service ACAS was called in to aid talks. Some progress was made, though there remain key points of dispute relating to patient and doctor safety, fair pay for work done and the definition of ‘social hours’ of working. Plans for industrial action were therefore re-instated. The first doctors strike in 40 years went ahead on 12th January 2106, with an emergency care model of action being taken. Further days of Industrial action scheduled for 26th-28th January were halted whilst negotiations continued. The 10th February marks a possible day of a full walk-out for Junior Doctors, should this be felt as necessary. NO Junior Doctor wants to go on strike, however, as a group feel passionately that the safety of their patients and fair working conditions to doctors remain paramount. They are also deeply concerned about the threat to the NHS itself. 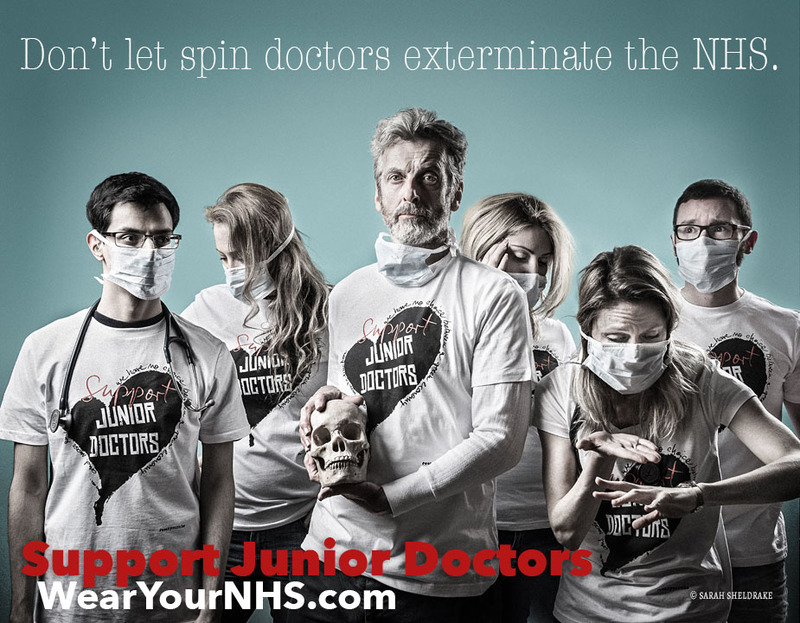 WEAR YOUR NHS is a campaign to demonstrate support for both Junior Doctors and for OUR NHS. We have all been, are, or shall be, patients one day. We shall support by collectively wearing SUPPORT JUNIOR DOCTORS t-shirts. Designed by none other than the inimitable DAME VIVIENNE WESTWOOD, who has been responsible for some of the most incredible designs known to man and woman, and supported by Ben Westwood.